Wow, what a great week of BEATLE BAG MANIA. We put all the entries in a hat and pulled out three lucky winners. 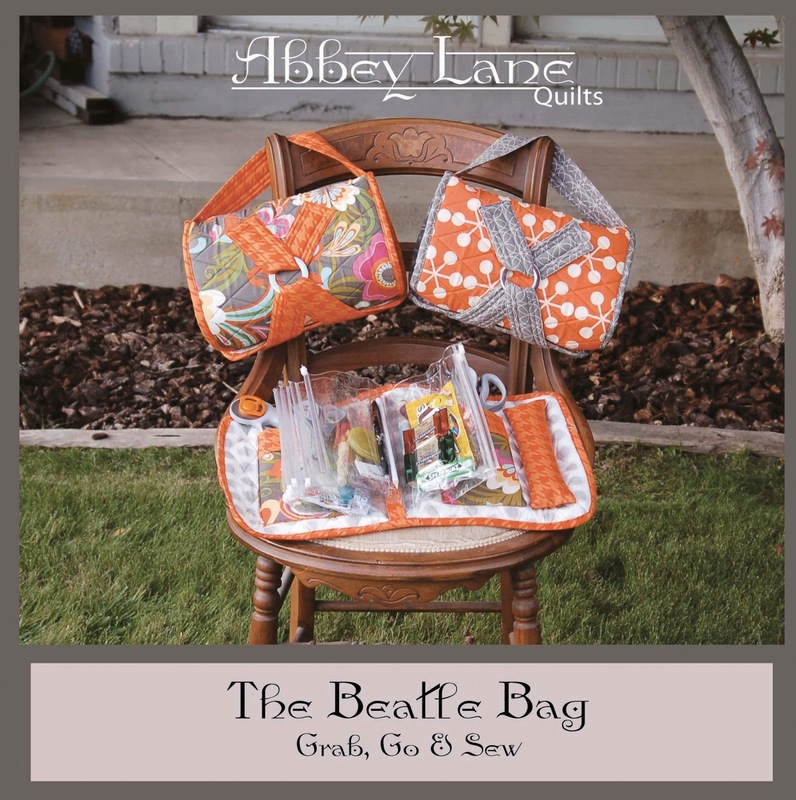 If you didn't win, you can still get a Beatle Bag pattern on our website, www.abbeylanequilts.com. The comments of what you would put in the bag were great, but my favorite was the one where the lady is going to make one for her daughter and put money in it for a trip to Europe. I want to be on her list. Wow, I just noticed that there were two Kelly's. Totally random. If you are a winner, please email us your shipping address to info@abbeylanequilts.com. Again thanks to everyone who shared, it is a great bag. While everyone has been busy finding all the great deals on Cyber Monday, this includes me, Abbey Lane Quilts decided to have a FREE GIVEAWAY instead. 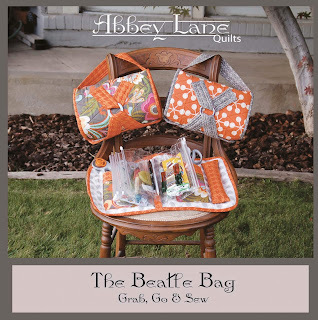 Yup, we are giving away 3 BEATLE BAG PATTERNS which include the inserts. Haven't heard about the BEATLE BAG yet, well here is your introduction. We debuted the BEATLE BAG, which is a Grab and Go sewing bag, at Market. It was a hit. By the time we got to Festival, people had come up with all kinds of uses for the BEATLE BAG including using it for stitchery, small projects, beading, crayons and markers, make-up, jewelry, pretty much anything you need to take with you. For tonight though, we are going to show you how we use it for a sewing kit to take with us to classes, guilds, retreats, or even just a friends house. The pattern includes 4 Inserts which are heavy duty vinyl bags. The have a zip closure. Each insert has two bags, one on each side, so in total you get 8 bags. They velcro into the beatle bag. You can fill the bag with all the things you need for sewing, we even give a giant suggestion list in the pattern. On the inside it also has two pockets big enough to hold full size scissors and a full size cutter. It also has a detachable pin coushin to put up by your sewing machine. Now, the fun part, it rolls up, fastens tight and off you go. The handle will even fit over the handle on your sewing machine roller. I think it is one of the cutest and the best part, practical and useful patterns we have ever created. One more bonus, once you make one, you will want to make more. We have refill packs for the inserts too. You can find out all the details about the pattern and the inserts on the website, www.abbeylanequilts.com. So back to the FREE part. To celebrate this new pattern, we want to give away 3 of them. You know the drill, here is how to enter. You will get an entry for each of the things you do below. 1. Become a follower of our blog, or let us know you already follow. 2. Become our friend on facebook, or let us know you already are. 3. Post it on your blog, send us the link. 4. Share the giveaway on Facebook. 5. Leave a comment here. Tell us what you are going to put in your Beatle Bag. 6. If you are great at #, and you know who you are, post #TheBeatleBag where ever you #. We will pick three winners next Monday night. Good luck, and thanks for stopping by.